A studio portrait of young Aboriginal boys, taken at Kalgoorlie sometime around 1900 by prolific goldfields photographer JJ Dwyer. Two professional cyclists wearing the Davies Franklin brand. Davies Franklin was one of dozens of bicycle manufactures in the early 1900s. Between 1860 and the early 1920’s, it’s estimated that some 2,000 Muslim camel-drivers were plying their trade within Australia’s vast interior. 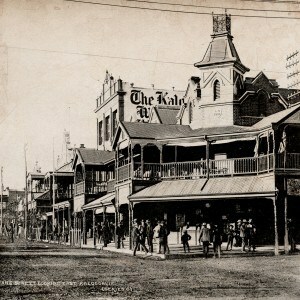 Exchange Hotel, corner Hannan and Maritana Streets, Kalgoorlie. The Exchange Hotel is an enduring Goldfields landmark. The offices of the Kalgoorlie Miner are next door. Leonora’s name honours a niece of Sir John Forrest, a pioneer explorer and WA’s first Premier. She was Miss Phylis Leonora Hardey. When Forrest was exploring the region in an 1869 expedition in search of the remains of legendary explorer Ludwig Leichhardt (who had disappeared in 1848), he came across a distinctive conical hill which he named in his niece’s honour. Unbeknown to Forrest, this prominent geographic feature was an ancient Aboriginal site of tremendous spiritual significance, including association with the ‘dreaming’ of the ‘Seven Sisters’. Leonora’s international fame, however, will be forever associated with the young Herbert Hoover, who would go on to become the 31st President of the United States of America. In 1897-98, Hoover was the manager of the fledgling but ultimately very rich Sons of Gwalia gold mine, just south of the Leonora town site and in the shadow of Mt Leonora. Hoover actively encouraged the engagement of Italian and other southern Europeans as underground workers at the Sons of Gwalia, and after Hoover left, a community of these migrant workers was established around the mine site that became known as Gwalia, Leonora’s twin town that would quickly necessitate a tramway connection. Today, Leonora and Gwalia offer visitors some very special insights into the life and times of the early goldfields and its pioneers. And its hinterland provides many natural attractions that represent the environment into which the thousands of 1890s gold-seekers first ventured. A beautifully restored historical Bed and Breakfast - Hoover House is overlooking a working gold mine, which will give you a fabulous opportunity to sleep in a President’s bed. Enter email address below to subscribe to updates from the goldfields tourism network association inc. This iframe contains the logic required to handle Ajax powered Gravity Forms. Trust the tick!